We’ve all been there, the day you bring home your new dog or puppy and they pee all over your floor, chew up something they weren’t supposed to and your find yourself suddenly questioning, “What did I get myself into!?”. I’ve done it, twice. But I can say that our two dogs are more than worth all the headaches they’ve caused (and still occasionally do). Dog ownership is a learning process and for me, it was a little bit of a journey finding and discovering what I believed in as far as training methods, veterinary care and even the right food and toys for our dogs. I"ll admit, before I knew better I've used a prong collar, let my dog run off leash in an open field or while we were on a hike and I even once believed that I had to be the "dominant" one for my dog to listen to me. We wanted to be responsible owners and so naturally, the first thing we did was enroll our new pup in beginning obedience class at the popular training facility that was conveniently located within a few miles of our house. They were also big promoters of every dog wearing a prong (or pinch) collar. A short while later, after reading many articles online, digesting what I read and learning more and more what I stood behind, we quickly switched trainers. This is okay, it’s better to switch versus feeling a certain way or disagreeing with the methods used, but not sticking up for what you believe in. We all make mistakes but can hopefully learn from them. 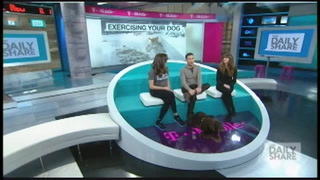 Switching trainers was one of the best moves we made since adopting our dogs. 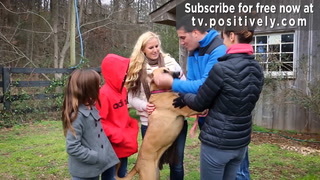 Our new trainer taught us how to use clicker training and the benefits of positive, reward based training. The progress we made was remarkable. Lola, our first dog, acted as if she was in a weight pull competition every time we hooked the leash on. This can be very frustrating as those with leash-pullers can strongly relate. Two months of dedicated training on my end and help from our trainer quickly taught me that yes, even I can have a dog that can walk at my side on a leash (without the use of a prong or pinch collar)! 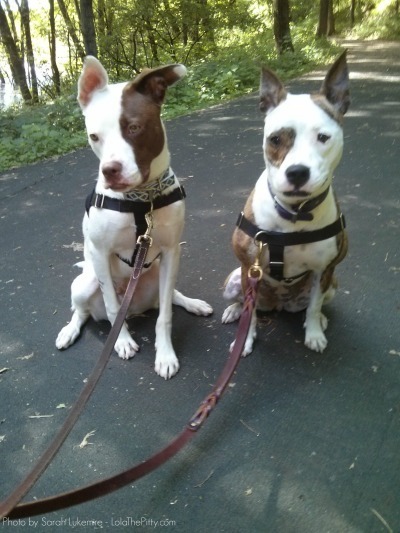 Read how we stopped leash pulling and learned how to walk on a loose leash here. Of course, using a trainer or going to a facility isn’t always an option for everyone. And let’s face it, much of the training needs to take place at home so that’s a good place to start. There are a ton of resources at your fingertips whether it is a book, online blogs and websites and on TV. 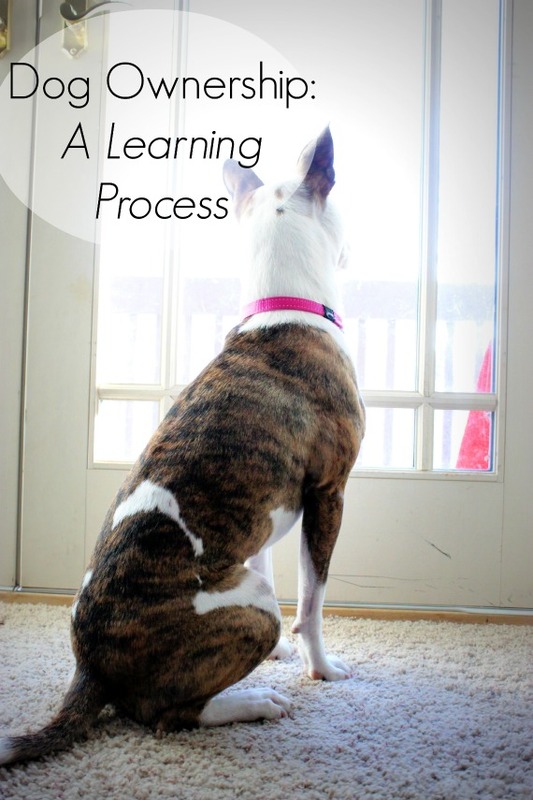 I personally use several online training resources such as Victoria Stilwell, Your Pit Bull and You, Paws Abilities, Patricia McConnell, Sophia Yin, and many others. We were very lucky and by word of mouth, found a vet that we love on the first try. It is important to choose a vet who you and your dog feel comfortable with, who respects your input and beliefs on your pet’s health, and who has patience with your dog. Even though we love our vet, we have visited different veterinary offices with our foster dogs that I could tell from the first visit, weren’t ones that I would personally use. Go with your instinct and if you get a bad feeling or are uncomfortable with any of their practices, it may be time to move on. We have two dogs that will literally play with and eat anything you put in front of them. Obviously this is not always the case. Some dogs can be very picky eaters and it may take some experimenting with different foods to determine what your pup likes best. Food for your dog can get very expensive, very fast – so determine what works for your budget, your schedule and go from there. Again, everyone will have their opinion on this, so try to take it with a grain of salt and feed what works best for you and your pup. I commonly use dogfoodadvisor.com as part of my research when checking out new foods or diets. Recently, Lola developed a reaction to what we determined was her food (after a year of being on that food). So we did our research, spoke with several friends and switched to a grain free minimal-ingredient diet with a higher protein and fat content due to her activity level. Again, I wish we would’ve switched much sooner. Poo tells a lot - we love nice small and solid stools around here, haha. We can’t forget about toys. Even toys have given us a scare and proven to teach us a thing or two. If your dog is a destroyer (*ahem* Lola, Rio), stuffed toys aren’t the best. Or maybe they are just given on special occasions if they really love them (and then immediately taken away so that a squeaker, stuffing, or a nose isn’t swallowed). After all, I’m sure none of us are really begging for any trips to the E-vet. Our favorite toys for around the house: Kongs, quality antlers, tugs and tennis balls. Knowing that from the beginning I’m sure we could’ve saved a buck or two. Of course, always supervise play time and never leaving a toy/bone with your dog when they are alone is wise precaution. For example, we leave our dogs with a Kong in their crate when alone, but would never do this with say, an antler. This was another learning experience. What have you learned from the first time you brought home your new dog to now!? Have you made any drastic changes in food, training and toys? Have you made mistakes in your time as a dog owner? I think we all have, after all this is life which is continually a learning process.